Mary Boykin Chesnut was born Mary Boykin Miller on March 31, 1823, in Statesburg, South Carolina. She was the oldest child of Mary Boykin Miller, the daughter of wealthy owners of a plantation (a large farm or estate with resident workers or slaves). Her father was Stephen Decatur Miller, a prominent politician who strongly supported states' rights, the idea that individual U.S. states should have supreme powers over the national government to set their own policies, including the power to legalize slavery. He was a South Carolina senator at the time of Chesnut's birth and had previously served as a member of the U.S. House of Representatives. During her early years, Chesnut and her family lived on her grandparents' plantation near Camden, South Carolina. When her father was elected governor of South Carolina in 1828, the Millers moved to the capital city of Columbia, returning to Camden when Stephen Miller won a U.S. Senate seat in 1830. By the time her father resigned from the Senate in 1833 due to health problems, Chesnut had begun attending a local school in Camden. When Chesnut was twelve, she was sent to Charleston, South Carolina, to attend Madame Talvande's French School for Young Ladies. There she completed her education with classes in literature, science, and history, as well as instruction in music, singing, and dancing. In 1836 she met James Chesnut, Jr., a Princeton University graduate who had visited the school to see his niece. James took an interest in the lively and intelligent girl, and over the following years he began to show romantic interest in her, despite objections from the Chesnut family. Even though Mary's family took her away for a time to Mississippi, partly to avoid James Chesnut's attentions, she married James on April 23, 1840, at the age of seventeen. She settled with her husband at his family's plantation outside Camden. When James Chesnut was elected to the U.S. Senate in 1858, the couple moved to Washington, D.C. 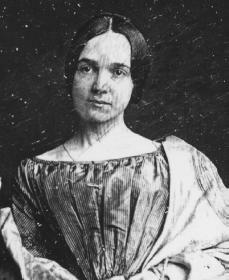 There Mary Chesnut enjoyed the social scene and became interested in the intense political arguments over states' rights. Mary supported the position that her father had promoted during his career and that her husband now championed. Although neither she nor James believed in the institution of slavery, they did uphold the right of states to make their own decisions on such matters. Abraham Lincoln's election to the presidency in 1860 angered Southerners, and with the secession (formal withdrawal) of Southern states from the United States, the threat of civil war loomed. On November 10, 1860, James Chesnut became the first Southern senator to resign from his post. In February 1861 Mary began a diary that recorded the explosive happenings around her during the years of the Civil War. Following her husband on his duties in the South, she provides a firsthand view of the political world of the Confederacy (the name for the Southern states that had seceded and fought as a group). After the war's first battles, she soon began to write of the horrors of the war as well. She recorded the stories she heard about various battles as well as her personal experiences, including tending sick and wounded soldiers and mourning the loss of friends and acquaintances. She strongly criticized the decisions of Southern leaders, and she complained about her lack of power as a woman in the South. the Confederate army's collapse. In April of 1865, Confederate general Robert E. Lee (1807–1870) surrendered in Appomattox, Virginia, ending the Civil War. After the war the Chesnuts returned to Camden. In 1873 Mary began to evaluate the extensive diaries that she had compiled during the war, and eventually she decided to publish them. While working to prepare and polish the material over the next few years, she published one story from her diary in the Charleston Weekly News and Courier. This was the only item that Mary published during her life. In the late 1870s and early 1880s, Mary's work was interrupted by a series of illnesses affecting her lungs and heart. Both her husband and mother had died in January 1885, and she was left depressed and with a reduced income. She died of a heart attack in Camden on November 22, 1886. After Mary's death, printed versions of her work appeared in the early 1900s. Although editors removed some material, even these incomplete versions became extremely popular for their wealth of information about the difficulties of Southern life during the Civil War. The diary also revealed her strong support for greater rights for Southern women, whom Mary felt were also enduring a kind of slavery in the traditional male-dominated society of the South. In 1981 a publication entitled Mary Chesnut's Civil War provided for the first time the complete version of her diary, revealing the full depths of Mary Chesnut's valuable personal history of the Civil War. Chesnut, Mary Boykin. A Diary from Dixie. Rev. ed. Cambridge, MA: Harvard University Press, 1980. Decredico, Mary A. Mary Boykin Chesnut: A Confederate Woman's Life. Madison, WI: Madison House, 1996. Woodward, C. Vann, ed. Mary Boykin's Civil War. New Haven, CT: Yale University Press, 1981.